Shaalom 2 Salaam: A Muslimah's Journey Along the Way From Judaism to Islam: Second Islamic Writers Alliance (IWA) Anthology Now Available for Sale! Second Islamic Writers Alliance (IWA) Anthology Now Available for Sale! Muslim Writers Publishing (MWP) and the Islamic Writers Alliance are proud to announce the release for sale of our second anthology, Many Voices, One Faith II - Islamic Fiction Stories. Yours truly has two short stories published in this anthology, Alhamdulillah! Today's world is indeed a global village. The wonders of technology in communication and travel have cut through the distant miles which used to separate us from one another. 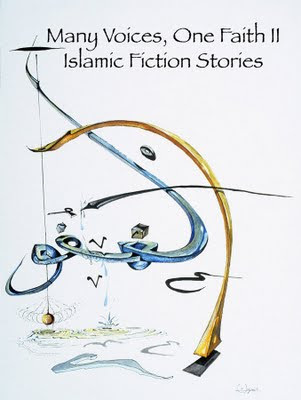 Many Voices, One Faith II - Islamic Fiction Stories is a literary example of the small world we are all a part of, showcasing the talents of the Islamic Writers Alliance membership which reach around the globe in their respective residences and origins. From the cover design of one of the beautiful names of Allah, beautiful and original interior illustrations, and the unique story-telling talent of the authors, their original stories combine the diversity and flavor of their backgrounds. You will find almost every region of the world exemplified in these wonderful Islamic fiction stories which skillfully and creatively present the importance of Islam in our daily lives. Many Voices, One Faith II - Islamic Fiction Stories is an enjoyable, entertaining, and enlightening read for non-Muslims as well as Muslims. Many Voices, One Faith II - Islamic Fiction Stories is the ultimate in the variety of selections written by some of the best Islamic Fiction authors in today's fiction book markets. Read. Enjoy. Benefit. The anthology will be listed at popular online retail stores in about a week. If you want to order now please do so by sending the following information to this email address: widadld@yahoo.com. Be sure you include the following mailing information: Your mailing name, mailing address (street/city/state/zip code) and phone # and number of copies you would like to order. You will be notified by email of the total cost including shipping fee. You can then advise if you will pay using USD check or payment through PayPal by sending payment to widadld@yahoo.com. You can also order from me in about a week, Insha Allah! Safiyyah, this sounds good. I hope to get a copy of this. And that ARTWORK on the cover is just amazing! She (I forgot her name) had her stuff at ISNA a few years ago and I stood in front of her pieces like a crazy stalker. I even think I shed a tear (I cry in front of good art). Love her work! Amazing! I wish I could buy ALL of her prints and put them up all over my house. Such beauty. But back to writing. I've been toying with the idea of going into Muslim non-fiction. There are so many weird intricacies to having a Muslim mind after having a non-Muslim mind set for so long and filtering those differences through your head. It's such a delicate dance sometimes. If I do write, I would like you to look at it first. For some reason, I really trust your judgement even though I've never met you in person. uh, actually meant "fiction" not "non-fiction". My blog is my "non-fiction" release. LOL.